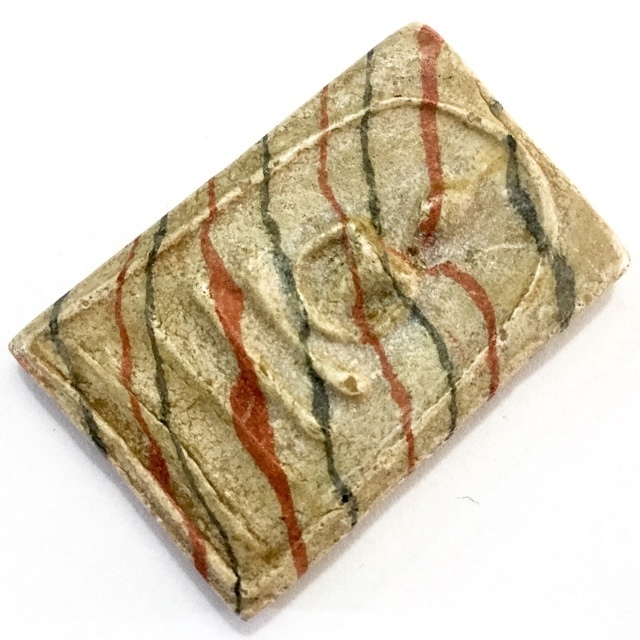 A very rare and Early Era amulet from Luang Por Pae, in 'Sai Rung' Rainbow Powders made from Nuea Pong Phao (Sacred 5 Powders in multi-colours, pressed, then dried and finally baked in a potter's oven). The amulet is from the very early era of Luang Por Pae, released around 2505 BE. The front face of the amulet features the Pra Somdej Pim Samadhi Buddha in Meditation posture, seated on a three tired dais, within an arched enclosure (called 'Sum' in Thai). The surface texture of the amulet reveals the density and hardness, that is ubiquitous with baked sacred powder amulets, and shows hardening through age over a period in excess of 40 years or more. The amulet has a smooth hard surface sheen to it, due to the hardened density resulting from the baking process. A fine layer of white Pong Puttakun powder has also risen up to dwell on the surface of the amulet, which is a trademark sign of an authentic amulet from Luang Por Pae. Luang Por Pae produced the first ever sacred powder amulets in 2494 BE, sixteen years before the creation of the Somdej Pae Pan (1000). The first Pra Somdej was a Pra Somdej in two Pim models. 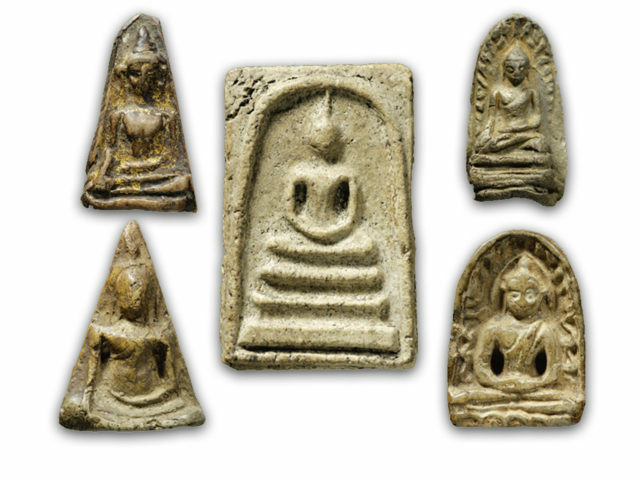 The amulets of Luang Por Pae are extremely favored and popular around the world, but due to the massive pantheon and Bewildering number of different models, editions and re-releases, it has become very difficult for all except experts, to distinguish between the preferred models and the less preferred ones. For this reason, not all models carry a high price, whereas the more well documented and easy to recognize models enjoy extreme popularity, and instill great confidence in the hearts of their owners. This is a perfect Buddhanussati Heirloom Amulet, that will hold its power for generations, and for your family members to cherish and revere, and pass down through further generations. 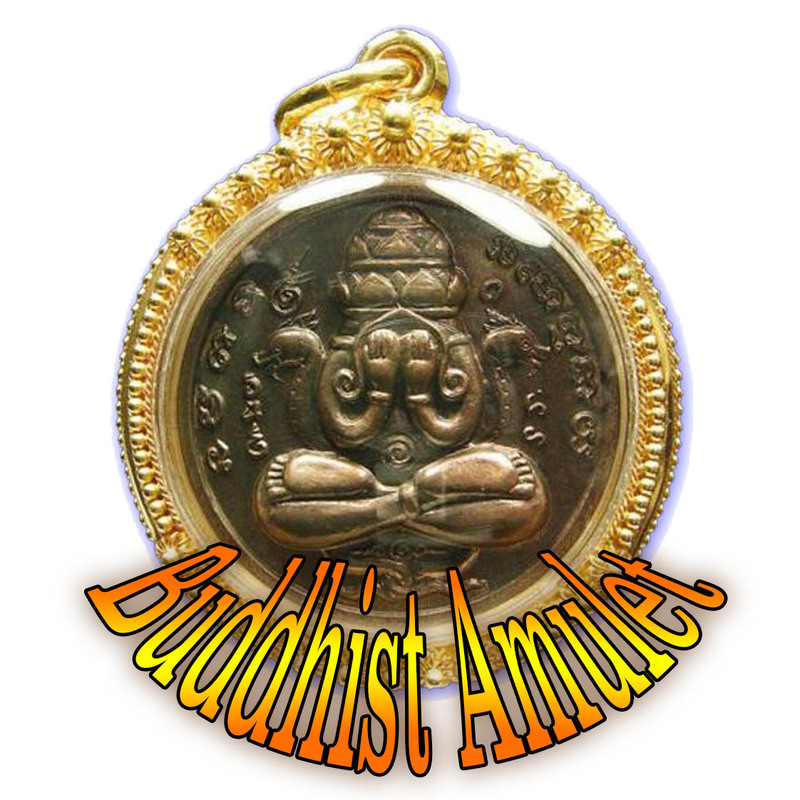 Highly recommendable amulet to wear, with pure Buddhist Blessings and no Black Magic or Karmic Residues to exchange, for the favors it brings the wearer. The amulets of this great master, have been seen to dwindle from the public amulet markets, which is due to the fact that not only Thai people have been revering and holding his Amulets over the last decade or so up, rather that all around Southeast Asia. Luang Por Pae's amulets are famous for the mass of Pong Puttakun that rises to the surface and leaves a fine layer of white mildew upon the surface, revealing empowerment by a monk with true purity of practice. This has resulted in an accelerated depletion of his Amulets, despite the fact that classic Amulets made according to the official formulas such as the Pra Somdej amulet, are making numbers of up to 84,000 per edition they have still managed to begin to disappear from the public view. This rare Luang Por Pae Amulet, can be considered to be a highly favored acquisition and a very difficult amulet to find, This fact makes the amulet not only attractive for its revered Maker Luang Por Pae, and for its sacred Power, but also for the fact that it is also a very difficult amulet to find. For collectors, this exhibit when added to any serious Luang Por Pae amulet collection, would easily stand out above others for its inclusion. A sure bet with this amulet for authentic Luang Por Pae Wat Pikul Tong Devotees and Collectors to enhance and complete their collection with, and for wearing and Bucha to a Sacred Votive Tablet of the Highest Sacred Value from an Arya Sangha Guru Monk of Immense Purity and Diligent Practice, with Royal decree Status and World Famous reputation. This amulet is extremely worth intensive study of its features and to remember and record it in your studies as an authentic member of the large pantheon of Luang Por Pae amulets, for its rarity is a cause of this edition being less known of, and even is often not listed in many publications which attempt to catalogue the pantheon. The amulet is hence a very important amulet to record and document for posterity. This 2517 BE Edition is an immensely desirable amulet that will never decrease in Sacredness or Material value, and can only increase in status and public esteem.